LearnMMD.com is here to be The MikuMikuDance Free 3d Animation Software Instruction Sheet that you have been looking for. Bunches of downloads are here … Scroll down and enjoy! Create animations, make Music Videos! MikuMikuDance is a free 3D animation software developed as a promotional element for fans of the Sony/Sega Vocaloid product. Featuring a high-style Japanese feel, MikuMikuDance has caught-on around the globe with tens of thousands of users and millions of MMD videos uploaded world-wide. The MMD program was introduced in Japan about 2007, without an English translation until 2010. The Japanese MMD Community is very strong and very active. They created a masterful collection of models, accessories and techniques for which all users today are most grateful! MMD 9.31 is the latest release of MikuMikuDance! MMD 9.31 runs great for most users of Windows XP, Windows Vista, Windows 7, 8 and Windows 10 … but we are getting reports of a couple of different kinds of errors, as well. Download MMD 9.31 from LearnMMD, open it up and see what you have … and then hurry back to LearnMMD.com for MMD tutorials! It is critically important to have those packages installed in your system. MMD will not run properly without them, and will not accept higher versions of the same as a proper replacement¹. The majority of comments asking for help about MMD acting wrong will be countered with “Have you DirectX 9.0c and MS Visual C++ runtimes installed?” inquiry, and more likely than not, resolving these will resolve your problem as well. ¹ The above does not mean you have to rollback higher versions of these libraries (that you most probably have) in favor of more obsolete ones. Runtime packages are products specifically designed to be able for all versions to coexist on the same machine. Still need help? Leave a comment or send Reggie an email. A while back, when MMD 8.11×64 was released, we got reports that it didn’t run on 64-bit machines … but 8.10×64 DID run … so, if you have too many problems with the latest 64-bit version, you might try running MMD 8.10×64. You can still download MMD 8.10x64 from LearnMMD.com. 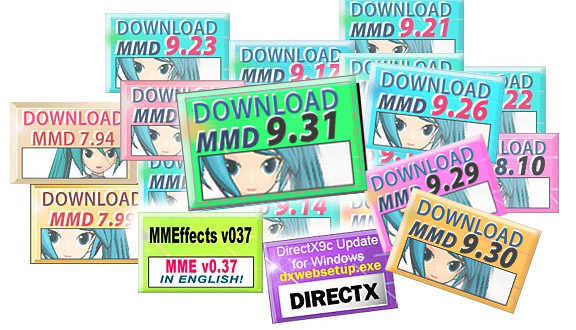 LearnMMD still has 64-bit MMD 8.10×64 available for download… an older version, February 2014! If you choose to download old MMD 8.10 so as to get Luka 1.0 … be sure to put her files into a separate folder and name the folder Animasa Luka_1-0, or something, because Luka 1.1 in the current versions of MMD uses the exact same file names … and you risk converting her into the old 1.0 version if you simply drop the old files into the model folder. LEARN how to Upgrade older MMD to MMD 9.31 … After you have downloaded and unzipped the zip, Reggie shows you how to convert your MMD 7.39 folder into a MMD 9.31 folder. MMD 7.39 runs great on XP computers and the newer systems, as well. You can visit the VPVP page https://sites.google.com/view/evpvp/ and see what is there. MMD 7.39 used to be the Version 1.3 on that page. MMD 7.39 is removed and only the latest version of MMD is available there. There is no “install” … just run it from your desktop. 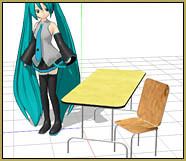 Have fun with it … Hurry back to LearnMMD.com for the information you need to get started with Miku Miku Dance. In July of 2011, I found that I needed to upgrade to, at least, DirectX_9 … and I had a heck of a time finding it on the Microsoft Support pages. This link at Microsoft is proven to work for all Windows versions … XP thru Windows 10 … I hope it works for you! Most likely you have the higher version of DirectX installed on your computer by now. The common mistake is to update it to the latest release and expect it to solve your problems. Well, it won’t. MMD requires very specific files that are no longer distributed by default, so if you have the “missing dll problem“, you *need* to install the redistributable pack listed here. Do not worry, it won’t overwrite your newer DirectX install! Download MMDxShow.dll Zip… Reggie’s personal copy! Try this fix for the Cannot find MMDxShow.dll Error message. RENAME your old MMDxShow.dll file (if you have one) so you still have it in case this fix doesn’t work for you. 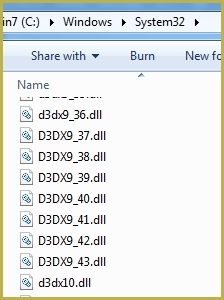 Then download MMDxShow.dll from LearnMMD.com … drop it into your DATA folder inside the main MMD folder. PMDE / PMXE is a software that lets you adjust or modify your MMD models. You can even create new models from scratch! The last version of PMD Editor that we recommended was the 039 version by ibozo, available from his dA page. Though not perfect, it worked and was easy to use. Be sure to UNBLOCK the zip before you Extract all (just right-click the zip folder, choose “properties” and check UNBLOCK). PLEASE NOTE: the PMD Editor is discontinued and won’t be updated past the ibozo 0139 version. PMXE is a continuation of PMDE, working with more advanced formats of MMD models and allowing loads of new possibilities! This new version of PMXE in English is more modern and offers many new features, so we recommend to learn it and preferably convert your models to .pmx format. The PMXE link above leads to a currently latest 0254f version of the editor, translated to English. If you prefer to use an unmodified Japanese version (or eager to check whether a newer release had been made since then), check PMXE’s Japanese home page, where you can always get the latest (but untranslated) release. LearnMMD has many articles about using PMDE/PMXE! 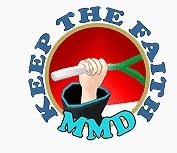 Be a good MMDer, “Keep the Faith-MMD”. Get MME v037 in English! … 32-bit or 64-bit! with English Installation Instructions in English! Reggie Dentmore has included all of the original files of the Japanese MikuMikuEffect V037 source zip and added English translation files and a new READ ME with installation instructions in English! There are also a couple of small GIF picture images to help with your installation. It’s not really MME in English … but it’s close! Included in that Read Me is the link to the Japanese source page … in case you’d like to visit and perhaps download your own MikuMikuEffects MME directly from the Japanese website. IMPORTANT! If you use the 64-bit version of MMD, you *must*choose the 64-bit version of MME as well, and vice versa. Mismatched combinations will not work! READ Reggie’s Article about MME V037! To upgrade your old version of MME … simply replace the old DLL files with the new ones in this download. LearnMMD.com still offers the previous version if you wish to own it. You can download the old Old MME v028 in English. The Mogg Project Face and Lips program helps you to create lip-syncs and VSQ files. LearnMMD has several articles that might help you to learn Face and Lips. Blender is a 3D model-making software. It is extremely complicated and is NOT for the casual MMD beginner. You almost need a computer-science degree to understand how to work with it. If you download Blender, search online for the MANY tutorials about using Blender. Please DO NOT ask LearnMMD for help with Blender; Blender is outside the focus of our work, here, on LearnMMD. According to the Blender homepage, Blender is the free and open source 3D creation suite. It supports the entirety of the 3D pipeline—modeling, rigging, animation, simulation, rendering, compositing and motion tracking, even video editing and game creation. If you download Blender, you will also want the latest version of the MMD TOOLS for Blender. Follow that link, Get MMD Tools, and read the info on that page. Again, LearnMMD offers no instruction for Blender and MMD Tools for Blender except as may be noted in our own model-making tutorials. If you download MMD Tools for Blender, please see its homepage for info, and do your research on Google and Deviant Art. Get MikuMikuMoving from the Moggproject homepage!! MikuMikuMoving is a new competitor to MikuMikuDance. MMM has some features not available in MMD. MikuMikuMoving will not play your existing PMM dance animation files … but it DOES use the same motion and model files. It also uses its own brand of effects … most of MMD’s MME effects won’t work in MMM. There is a list of MMM effects on the Moggproject homepage. 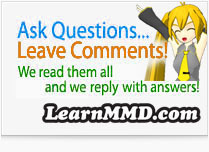 … See the MMM Articles on LearnMMD … and visit the LearnMMD MMM Page. GIMP is a freeware program that easily creates animated GIF files. It is powerful software that is able to produce fine images rivaling the quality of Adobe Photoshop. The buttons and controls do not follow the same scheme followed in Photoshop … so … if you are a hard-core Photoshop user like I am … you will probably become totally frustrated with GIMP! Newbies with no Photoshop experience will probably run GIMP without a problem “:o). All of the instructions and documentation is online. Try it out. Enjoy! Audacity 1.3.13 is now Audacity 2.0 – make WAV files! from your music & voice! The Audacity program is a powerful tool for all kinds of sound editing … but … for MMD users, it’s a simple tool! To make a WAV file, just IMPORT your sound file and click EXPORT. Simple! Click the button to go to the Download Page. See my Post about the Audacity software. Click the button to go to Google’s SketchUp page and get your free download of this powerful tool. Click the next button, too, to get the Plug-In that let’s you save objects for MMD. Click the button to get the “3D Rad Exporter plug-in” for SketchUp that lets SketchUp save drawings as DirectX file objects for MMD Accessories. I can no longer find that plugin online, so I am hosting it right here, on LearnMMD.com. Click that button to get my personal file. You will need to drop that plugin into the Plugins folder inside the actual Program folder. Go to My Computer… C drive, Programs, find your Sketchup folder, open it and see the Plugins folder. Add my file to that folder. Sketchup will now see it as a plugin. Again… This is NOT an installable Plugin, YOU have to install it, yourself: When you download that file, you have to install it manually. Drop that .rbs file into the Plugins folder inside the actual Google/Sketchup folder inside your computer’s Programs folder. My Computer>C:>Programs>Google>Sketchup>Plugins. After doing so, you can close everything, start Sketchup, and Sketchup will now see the plugin. LearnMMD hosts a load of items made by its creators and team for you to try and play with. LearnMMD Stage… the official stage of LearnMMD.com! LearnMMD.com is proud to offer our LearnMMD Stage … created especially for the readers of LearnMMD.com and for MMDers everywhere, by Deviant Art’s “trackdancer“. You will love this stage; it has a mirrored floor, “lights” that work when you engage the AutoLuminous effect, a custom dark skydome with distant soft “stars”/spotlights, an optional “meter” that displays VMDSpectrum data … and, what could be a “world-first”: a tinted motion capture screen! … or you can use the included “standard” screen. See The Demonstration Video on YouTube. See “The Full Instructions” to learn how to setup your new stage! See the intro-article on LearnMMD.com. Instructions are included in the ReadMe file and the included “comic” image. To create VMDspectrum files that will drive the Sound-Spectrum Meter included with the LearnMMD Stage, you will need this little program. For instructions on how to use VMDSpectrum, read Neko-Man’s article on LearnMMD. Also you may learn it from Trackdancer’s illustrated instructions. Get the LearnMMD Auditorium Stage! Download my Auditorium Stage accessory … a nice school-auditorium stage featuring plenty of drapes and the Theater Seats. See it in action on YouTube! My guys needed a nice place for rehearsals … I could not find one … so I made one! … using Google Sketchup and the 3D-RAD plugin. Read all of my notes about the construction and use of the LearnMMD Auditorium Stage. and SEE THE INSTRUCTIONS for this stage. Get the LearnMMD Theater Seats! These new seats are included as part of the LearnMMD Stage (available above). SEE IT in action on YouTube! This 600kb download accessory features 2-D silhouette figures placed in these Sketchup-drawn rows of seats. Not any degree of detail in this model … but it’s a nice addition to any empty auditorium or theater setting that you may own. It’s 8-rows of fun … and you can load it more times … enough to fill any space that you have! Download the LearnMMD Crop/Transition Panel! Use this accessory to add special effects to your animations! Download this file and drop it into the Accessory Folder inside your Users Folder. Attach it to a dummy bone and maneuver the panel to create transitions and window cropping. Experiment! See the Post for the video and other info! Download this set of MMD Balloon PMX models! created by LearnMMD’s GloriaTheAnimator… known as vanillabear3600 on Deviant Art! Vanillabear3600 created these wonderful models from scratch. Each has a dangling string that wriggles as the balloon dances on the air. There are facial-sliders to stretch and compress the balloons… and even one to make them into heart-shaped balloons! Use this accessory to give your models a place to stand when the motion data starts your model somewhere above the stage-floor! Sometimes a motion data calls for your model to be on a roof or on a staircase… but YOUR stage doesn’t have those features. … your model needs a place to sit or stand… THIS is that place! See the descriptive article about using Reggie’s DeckPanel. Download the Reggie’s Cafeteria Table and Chair! There’s nothing more iconic about a “school” setting than these classic Cafeteria Table and Chair accessories. Reggie made these from Sketchup models he found in the Warehouse. Use the Si size parameter in the AMP to size them to match your needs. Load them as many times as you wish… one table and six chairs… 8 tables and forty chairs… whatever! See my article where I describe these accessories. Get Reggie’s MMD Wooden Stools! 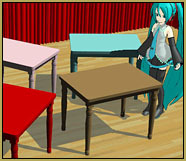 There are 10 colors … including natural wood, Miku Blue and Chiffon! The READ ME file gives credit to the original Sketchup modeler … and gives the OK to redistribute as long as you keep the folder and file names the same. Have a seat! Every kitchen with a breakfast-nook needs a nice wooden table. This painted wooden table accessory will fit right into almost any domestic scene! The ZIP includes five color versions of the table … and the .skp Sketchup file for the table so you can paint it it, yourself! Reggie created this lamp model using Sketchup. It comes as TWO .x models: ON and OFF. These look great and will inspire you to switch-On and Switch-Off! 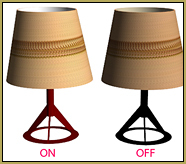 Read the article about these lamp models. Get Reggie’s Rocking Chair Collection for MMD! This is a set of 10 chairs … 9 are in bright colors and one has a wooden finish. I created the wooden one for use in my ongoing “Dueling Banjos” project. Attach your chair to a dummy bone and “rock” it on the Red axis. — Enjoy! Download Reggie Dentmore’s MMD Folk Guitar Accessory! I made this guitar for my Dueling Banjos project … from a Google Sketchup model that I found in the Sketchup 3-D Warehouse … a model by JJY. I modified it to be the right size for Miku and I adjusted some of the dark colors so they’d show up in my new accessory model. See my Dueling Banjos project articles. Have fun with your new guitar! For “Dueling Banjos” … You need a BANJO! Here it is … by special request! … the Banjo model I created using a model from Google’s Sketchup 3D-Warehouse. I converted the Sketchup model into a “.x” Model using the 3D-RAD plugin. Read all about how to do it! Please rename the file if you make changes to it. See the “Read Me” file in the download. Enjoy! AND we have an English Version of it right here for you. See Reggie’s article abut the Nameplate Effect for the full set of instructions. Reggie’s Evil Eye effect gives you a nice dramatic effect as you’ve seen in many an anime moment … when the camera cuts to a character who is having a panic attack about something! See Reggie’s article about the Evil Eye effect to get the full instructions. LearnMMD.com now hosts the files for Happy Hands by Emmersaur. Read the Happy Hands Meme article for the full instructions. Download the WAV file for the LearnMMD “Project for MMDers” “Ring Around the Moon”. It’s not a meme … because all that is included is the WAV file, .vmd notion files for the singer’s lips … and a video on YouTube to serve as an inspiration to get you started. The download ZIP includes the WAV file and the .vmd motion files for the lip-sync. Read Reggie’s article about this Project for MMDers. Download Lip-sync and Soundtrack Mp3 for this wonderful little love song. Again… It’s not a meme; it’s a Project. All that is included is the WAV file and a .vmd notion file for the lip-sync. There are TWO Mp3’s in there… with and without the applause sound effect. See my write-up about creating this animation. LearnMMD’s ZAZI created this little animation using the sound from a Target video in which an employee gives an amazing pep-talk! Included are motions for one model and camera, the WAV file, and a couple of images you might use as a background. Feel free to modify and customize those motions and images. Read the ReadMe for full instructions and credits. See the LearnMMD “This is Target” meme-demo video. Get Reggie’s Little Pose Collection! Enjoy this little set of VPD files. It’s fun to have these just for when you download a new model and you want to see what you have. Fun to have a quick pose for your models when you want to show MMD to a friend. Click to see the poses in this article. You get 3 complete poses and a couple of “relaxed arm” poses. Here it is .. The LeekSpin Pokka … Click the button to Download the Leek Spin Polkka. Because of a mix-up with cap I and lower case l, this song is often called Levan Polkka while it’s real name starts with an i … Ievan Polkka … Ievan Polka. … or just click the button. There is no documentation for this file. I don’t know who made it or where it came from … but it seems to be the standard Leek-Spin song and it works just fine with the MMD program. You will find that it lasts about 4440 Frames! Save it where you can easily find it. Open a NEW file in MMD and then click FILE and LOAD WAV FILE. Select your file. You will then see it on the oscilloscope window on the MMD panel. Have fun and Practice, Practice, Practice! “:o). 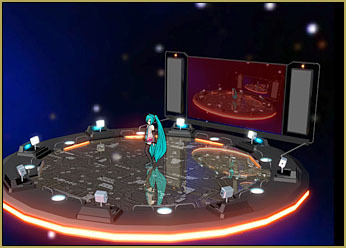 Visit MikuDance.info to find links to new models, accessories and special effects for download. Mikudance.info is almost “off the air” … it’s creator has soured on and quit using MMD. His web page was a huge resource for everything MMD. Tons of models and accessories … and a few tutorials, too. His entire site has been saved as an archive-version. Click this button to go to the archive for MikuDance.info for an amazing number of models and accessories for MikuMikuDance. Fine movements are possible with MMD. I wanted to have quick access to various hand poses and finger positions … so I created a set of VPD files that I could use and share with you. See: Reggie’s Hand Pose Collection for details. Try them out! When you get my ZIP file, click EXTRACT ALL, open the new folder and Select All of my poses, and drop them into your Pose Folder inside your Users Folder in MMD. When you use them … you will see that some of the hand poses may poke a finger or thumb through a model’s sleeve. You can adjust the sleeve positions or flex the character’s wrist to get away from that. Have fun with ‘em! See my Write-Up on these poses here: Reggie’s Hand Pose Collection. Also see the Smooth Motion post in Contents. I created this walking motion with 5 full strides … 10 steps. See it here: Make Miku Walk! It is pretty good … and since it is a .pmm file you can run it and edit it … have fun with it. Please rename the file if you make changes to it. 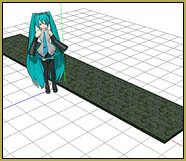 See the write-up and learn how I created this animation on this page: Make Miku Walk! My new WalkTest8 file shows that Walking is getting easier! My new walk test file is cleaner than my previous motion file. See it at https://learnmmd.com/EasyWalk . I started by sliding the model back a bit so the toes are on a ruled line … registered. Then I moved out 15 frames and advanced the Center and the Left Leg IK to the next line. Registered. I COPIED the Left Leg IK position. I then went out 15 frames and PASTEd that Left Leg IK data. Then I moved the Center and the Right Leg IK out to the next ruled line, registered, and COPIED the Right Leg IK position. Advanced another 15 … and so on. This created a nice sliding/skating motion. Then I went back and added some foot and hip action. Go ahead and download this little file and play it for yourself! i cant dowland on windos 7 ? I am sooo frustrated here…. I have downloaded 64 ver of both MMD and MME. (Have checked 10 times and redownloaded like 20times :( ) MMD works fine. I have download all 3 necessary files. BUT MME button STILL refuses to show up!! I don’t know how to fix this. Can anyone help? I have one problem with PMDE / PMXE. When I try to open them. it gives me an error saying DirectX9.dll was not found. Even when I installed the end user runtimes. Did you just download the runtime, or committed the whole installation procedure as instructed? Check the contents of your C:\Windows\System32 folder for necessary files that should be present if you did everything right. I have one itty bitty problem. When I try to open PMD Editor / PMX Editor it gives me an error saying DirectX3DX_9.dll was not found. Even when I installed direct x 9 End user runtimes. Is there a solution to this situation? Hi, I’ve just downloaded the newest version of MMD. I’ve rendered a video and it’s all saved. It was going fine until I played the video itself, it keeps juttering in the video, stopping and starting every few seconds, both the animation and the music. I have saved the same video with a different frame rate. Is there any way to fix this? What codec did you use and have you tried any others? What frame rate did you try originally, and what happened when you saved with a different one? Read Troubleshooting. Read Step-by-step. Read ANYTHING. Also know: this is not an app… MMD only runs on a Windows PC. That PC needs a mouse and a strong graphics card. MMD will not run on a phone or a tablet. You’ve gotta tell us all about it… What did you try, what did you do… what happened next? When you need help, when you leave a comment. you have got to pretend you are talking to a child on the phone, you’ve gotta tell us all about it because we have no idea what you are seeing. I downloaded DirectX and opened mmd. it still didnt work. any ideas what to do? Do you get an error statement? Did you run that DirectX runtime? … Downloading, alone is not enough. If you are running Windows 10, the system will ask you where to save to… here is the instructions. Explain yourself in more details, please. Uhhh… It is normal that MME does not work on my PC even if before it worked, it does not work anymore ? More symptoms, please. What has changed between “did” and “did not”? Install required software. Hint: it’s right on this page. We have MANY comments… which “same problem” do you have? Aversion to reading instructions. There has to be a separate article in the List of Human Diseases for that. Updated my mmd a few days ago and the codec that I usually use (Cinepak Codec by radius) to render in is gone. How to fix? A) Is your MMD 32 or 64-bit, and is MME of the same type? B) Did you install DirectX 9.0c?